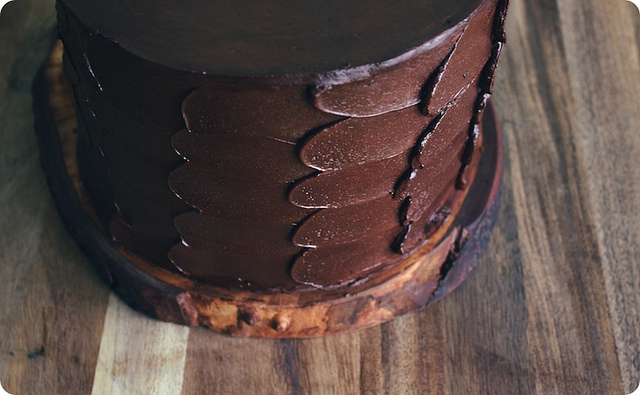 Now this looks like a manly chocolate cake, doesn't it? The rough yet controlled icing job, nestled atop of a slice of lumber, finished by a butcher block table.... This will be my inspiration for Nathan's birthday cake on Saturday. Yes, my love monkey (I know, disturbing pet name) is turning 27 on Saturday, and I want to make him and even better and prettier cake than last year! Happy Tuesday to you all. I've been working like a crazy lady at my day job, preparing for a semi annual meeting. But I have lots of ideas dancing in my head, including a long overdue vlog post, photos of my new business cards, and the reveal of the "artwork" hanging above my couch!